Acupuncture is an ancient healing art that is one of the most continuously used medical systems in the world and helps to facilitate healing in the body naturally. It’s been practiced for thousands of years and research shows it can successfully treat the root cause of many health issues instead of suppressing symptoms. Acupuncture is a safe, effective, and drug-free therapy that involves the precise placement of very thin and relatively painless needles into specific points throughout the body. The many benefits include increased circulation, reduction of pain and inflammation, improved oxygen levels, quicker recovery times, less stress, increased energy, enhanced mood, better digestion, restful sleep, prevention of illness, and much, much, more. Many practitioners combine acupuncture with fire cupping, a long respected alternative treatment. Chinese medicine experts have employed this highly effective technique for more than 2,000 years. It involves the use of a warm glass. To produce the necessary heat, a cotton ball can be soaked with alcohol and burned inside of the cup. After a flame warms the glass, an acupuncturist quickly places it on the patient’s skin. The fire has consumed the oxygen, so a vacuum is created. This suction causes it to pull on the skin and remain in place without pressure. The patient’s body reacts by increasing blood circulation and enhancing energy flow in the treated area. Fire cupping treatment has a number of potential benefits. It can eliminate respiratory health problems by improving a person’s ability to breathe. This process may also enhance digestion or reduce pain in the targeted area. Patients normally experience little or no discomfort. Moxibustion is an important component of modern acupuncture practices. 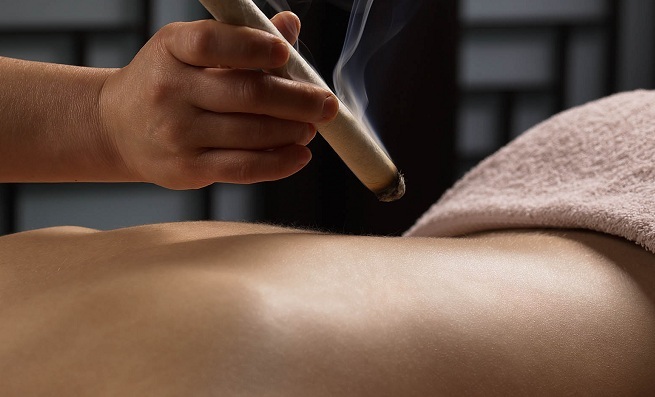 Moxibustion is a type of heat-based acupuncture treatment in which dried plant materials, referred to as moxa, are burned on or near the skin’s surface. The thought process behind this treatment method is that the heat will further entice the flow of Qi—or life force–in the body, while dissipating unhealthy pathogens. Many believe that moxibustion helps to alleviate dampness and cold throughout the body, and even turn breech babies in preparation for upcoming labor. Moxibustion is also known to cure general weakness caused by a myriad of medical conditions. Moxa is typically made up of a leafy material of dried Chinese mugwort. Mugwort, also called nagadamni, has been used in traditional Chinese medicine for thousands of years. It is known to treat cardiac issues in addition to feelings of unease and general tiredness or malaise. With this specific method, moxa material is flattened into a small, cigar-like pole that is allowed to smolder, generating a form of penetrating heat. Therapy focused on restoring energetic imbalances of the mind, body, and spirit. Emotional trauma that we experience throughout our lifetime can get stuck and create blockages leading to more serious health issues. By clearing these blockages one can break free from negative cycles and regain balance and wellbeing. May encompass meditation, breathing, and slight moving exercises. Guasha is an East Asian alternative medicine technique that is gaining in popularity in the west. It involves repeated pressured strokes over skin that has been lubricated using massage oil. This acupuncture technique has been proven to have anti-inflammatory effect. According to a study published in the Journal of Pain Medicine, guasha can help to relieve chronic back pain. If you have Achilles tendinitis, leg muscle problem or any other foot problem, a few sessions of acupuncture will help. Guasha involves scrapping. Tight muscles in your legs will be scrapped so that to facilitate permanent relief from the problem in question. An acupuncture practitioner well versed in East Asian therapies is the best professional to perform Guasha. Hundreds of acupuncturists in the west are offering Guasha. This alternative medicine therapy will stimulate blood flow in injured areas subsequently facilitating healing. Guasha stimulates the body’s immune system leading to the alleviation of ailments such hepatitis B, fever, asthma, bronchitis, back pain, migraine and many others. Intradermal needles are an important component of modern acupuncture practices. Intradermal needles, sometimes called buried needles, are very short and made of thin stainless steel wires. They are inserted about 1.5 millimeters underneath the skin at a slight angle. An acupuncturist then secures the intradermal needle to the skin with waterproof medical tape. When they are properly inserted, a patient should not feel them—even if the insertion area moves or is touched. These needles can be left under the skin for up to a week as they provide continuous treatment. Acupuncture therapy using intradermal needles has been shown to greatly improve muscle soreness, various localized pain, as well as lethargy. 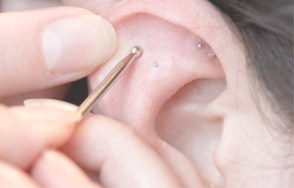 Due to their small size, intradermal needles are also ideal for insertion to many acupuncture points found within the outer ear that are known to alleviate pain throughout the body—from the top of the head to the kidneys, esophagus, and the tips of the toes. Is a Chinese bodywork therapy which uses various massage techniques including Acupressure to stimulate and manipulate areas of dysfunction. Helps to restore balance and function. *Please Note: One or more of the modalities below are complementary with treatment and may be added by the practitioner based on the patient’s needs. Fire Cupping is available separately too for $40 as a 30 min session.